Yes that’s right! First Prizes! Not just one First Prize, but more First Prizes than any other poetry slam that has ever existed, will exist, can exist, does exist or never existed! And you can write that in your CV! And because it is a poetry slam we have feature acts of poetry! Socially random with +33 charm points Omar "Ion" Holmon lives life like Doug Funnie and believes he'd be the only Jedi whose lightsaber would match his chuck taylors. When not imagining himself in anime fight scenes or working to make the world more abnormal he spends his time in slam poetry competitions and talking about his love for otters/pandas. He has represented New Jersey (Loserslam) and New York (Nuyorican & Urbana) at the National Poetry Slam. He has also been on Ted X, Button Poetry, Verses and Flow and even a commercial for Laphroaig whiskey. 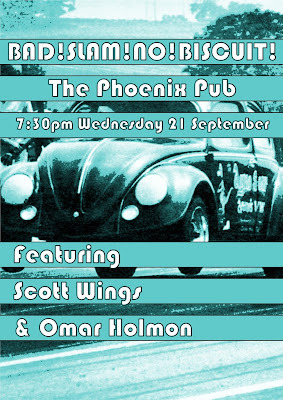 Scott Wings is one of Australia’s foremost performance poets, winner of the Performance Poetry World Cup, a multi-slam champion, rapper, comedian, performer and writer. His one-man show Icarus Falling was a sell-out at the Edinburgh Fringe Festival 2014, receiving five 5-star reviews plus a Total Theatre Award Nomination for Best Emerging Artist. Icarus Falling has shown at Crack Theatre Festival and at the Brisbane Powerhouse. You can find Scott hosting Ruckus Slam, training with Zen Zen Zo Physical Theatre Company, or on the road performing and facilitating writing and performance workshops. His most recent shows are Colossi and The Idea. 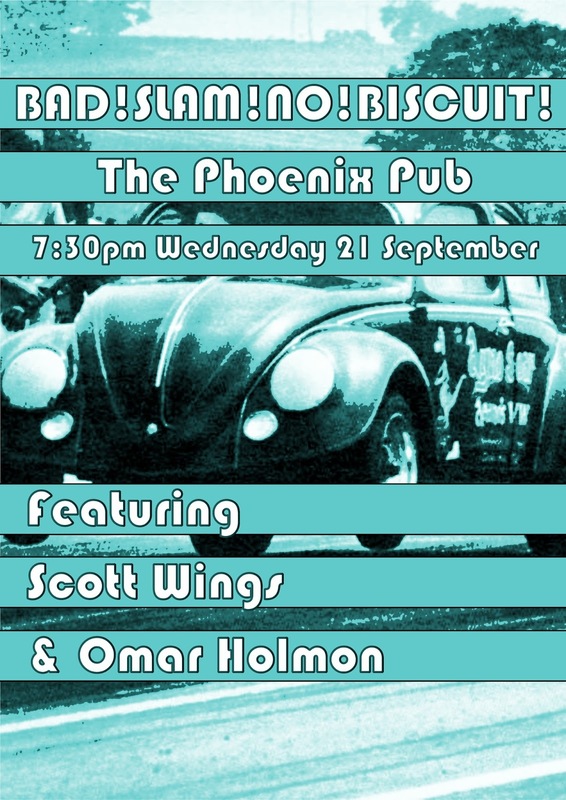 So join BAD!SLAM!NO!BISCUIT!, The Master of Conflict, The Score Adder, The Sacrificial Poet and all the feature acts in the Phoenix Pub for BAD!SLAM!NO!BISCUIT!! BRING YOU, BRING WORDS, BRING YOUR FAVOURITE CAR. And remember 2 minutes, no music, no props, your original material- unless you’re a rebel rule-breaker for whom rules mean nothing and we love you.